Each species needs adequate room to live happily and to promise a full recovery. The relocation of the owls on the quieter end of the property has allowed them to recovery from injuries and live peacefully. Many of the rescued owls have been brought to TRR by the wildlife ministry and are primarily victims of car accidents, injuries in barbed wire and electrocutions. Many are amputees. Owls are predators and territorial, it is important that these beautiful birds have separate mews. The new enclosures located at the bottom of the property where it is quiet so they can sleep during the day. We plan to build 10 mews to accommodate the seven species we currently have and the new raptors we are receiving regularly. As we accept more owls we need to answer to the growing population by building new structures that will promise them a comfortable and healthy life at the Ranch. The release of raptors omitted at the Ranch is extremely successful. 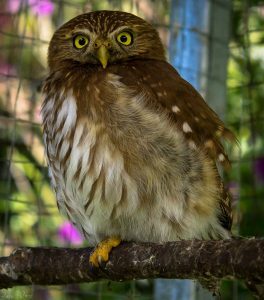 We have two pre-release enclosures for our raptors on the property where we release the owls and other raptors who do not suffer from permanent handicaps.